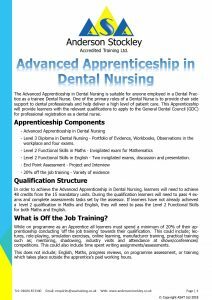 The Advanced Apprenticeship in Dental Nursing is suitable for anyone employed in a Dental Practice as a trainee Dental Nurse. One of the primary roles of a Dental Nurse is to provide chair side support to dental professionals and help deliver a high level of patient care. This Apprenticeship will provide learners with the relevant qualifications to apply to the General Dental Council (GDC) for professional registration as a dental nurse. Level 3 Diploma in Dental Nursing – Portfolio of Evidence, Workbooks, Observations in the Workplace and four invigilated exams. In order to achieve the Advanced Apprenticeship in Dental Nursing, learners will need to achieve 48 credits from the 15 mandatory units. During the qualification learners will need to pass 4 exams and complete assessments tasks set by the assessor. If learners have not already achieved a level 2 qualification in Maths and English, they will need to pass the Level 2 Functional Skills for both Maths and English. The End Point Assessment consists of 2 separate parts, a Project and an Interview. The Project contributes to 75% of the End Point Assessment, this is a 2000-3000 word project which will demonstrate the skills, knowledge and behaviours required for a dental nurse. The project will be based on a theme that is relevant to the dental practice, there are five options for a learner, employer and the training provider to discuss, one option must be chosen. The Interview contributes the remaining 25%, this is a structured discussion between the apprentice and the independent assessment centre focusing on the project results and how they have performed during the apprenticeship. This can only be taken after the minimum duration (18 Months) has been met. While on programme as an Apprentice all learners must spend a minimum of 20% of their apprenticeship conducting ‘off the job training’ towards their qualification. This could include; lectures, role-playing, simulation exercises, online learning, manufacturer training, practical training such as; mentoring, shadowing, industry visits and attendance at shows/conferences/competitions. This could also include time spent writing assignments/assessments. There are no specific entry requirements, however candidates will ideally already have a grade ‘C’ or above in Maths and English. If not this will need to be achieved before completion of the apprenticeship. All learners will be required to carry out Initial Assessments in Maths and English, prior to enrolment on the course. Learners will need to be working a minimum of 30 hours a week to meet the apprenticeship funding guidelines. Following the completion of the apprenticeship successful candidates will be able to register for their GDC Licence. After gaining some experience as a qualified Dental Nurse you can look at undertaking a course to become a Therapist, Dental Technician, Dental Laboratory Assistant or a Practice Manager.